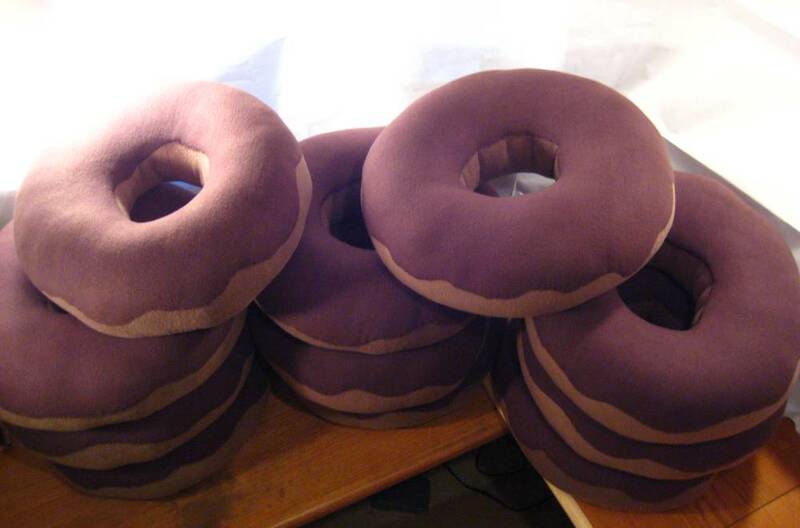 Eleven donuts done and shipped. Whoo hoo! They were a gas to see stacked on my work tables. Shortly after I finished them off I had a request to go small. 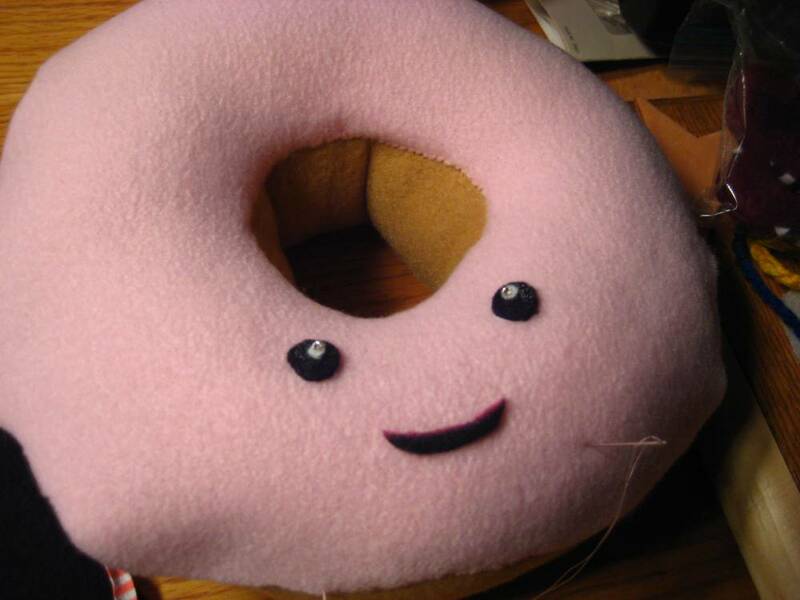 Could I make a Kawaii-style pink donut about 18 cms? Certainly. It’s going to be a new listing at DarcyArts as soon as I get the last stitches in. She looks big in the close up but she’s a mini. Each eye is dotted with a tiny rhinestone. There is also a bit of silver glitter on the round black eye. I’ll be playing with this design a bit. 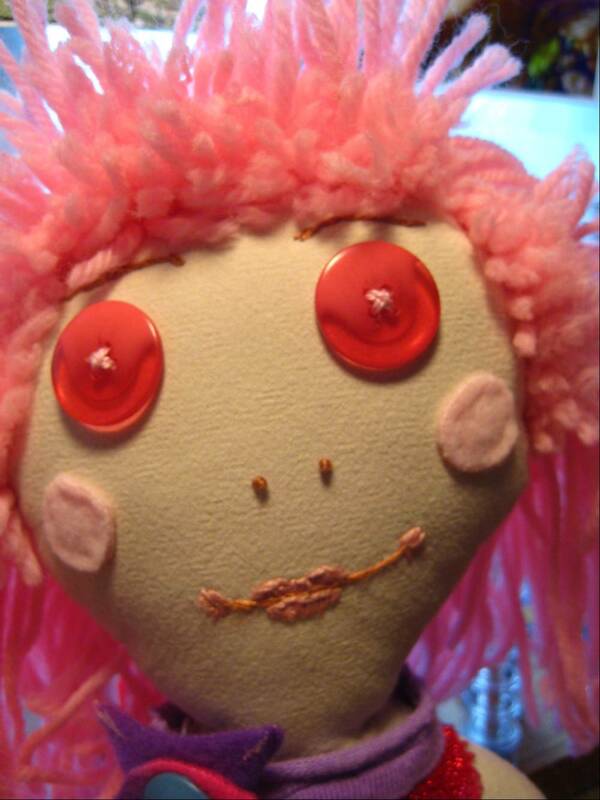 the facial elements are simple but I am going to tweak them to suit my vision. Increase the color level please! One of my goals this year was to refine existing designs. Now, I must say, that the word refine is a bit cold and hints at perfecting a thing so maybe I’ll use the word amplify. 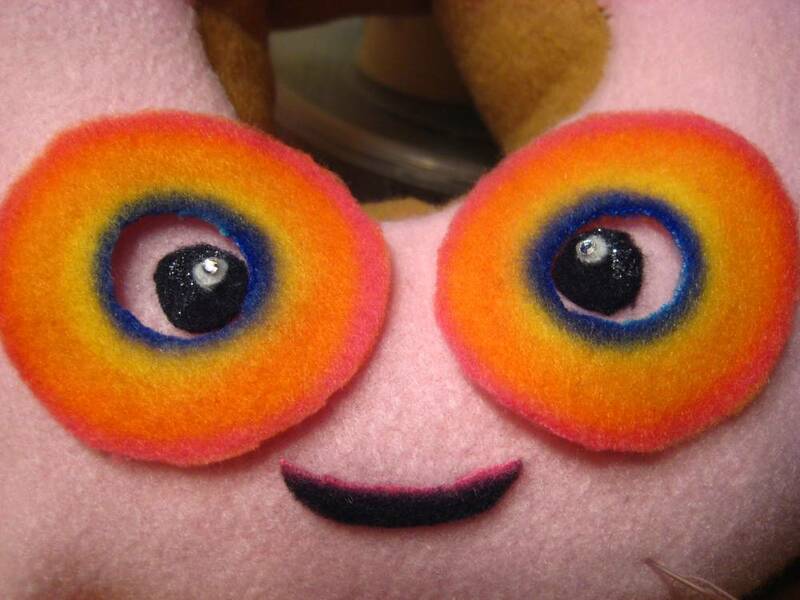 I’m increasing the vibrational level of the mini donut eyes, moving the color level knob closer to 11. Oh, my, yes. Better. 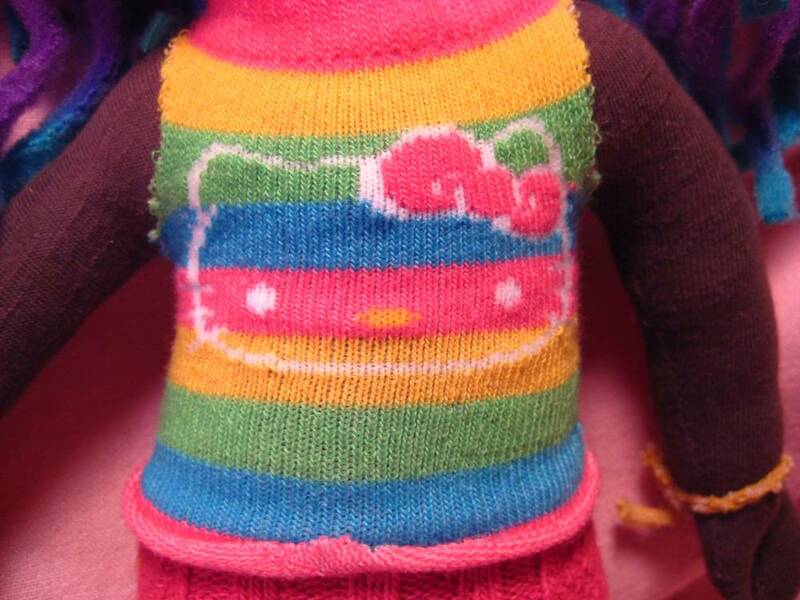 The rainbow rings give the mini donut a kind of psychedelic owl effect. 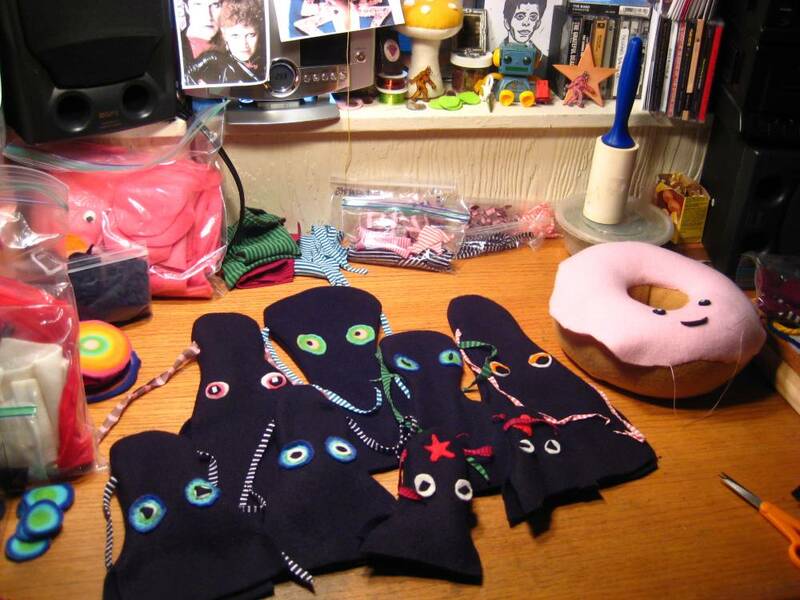 I’m tweaking the eyes on my black octosquid, too. One simple element — a remnant of fleece with a rainbow circle pattern set off the experimenting. Serendipity. The Rainbow Whale is up over at DarcyArts at Etsy, swimming free and easy through a sea that is sometimes rough but always life-giving. We all need to remember that there are so many creatures in the sea and each one is a special shining jewel on this planet. 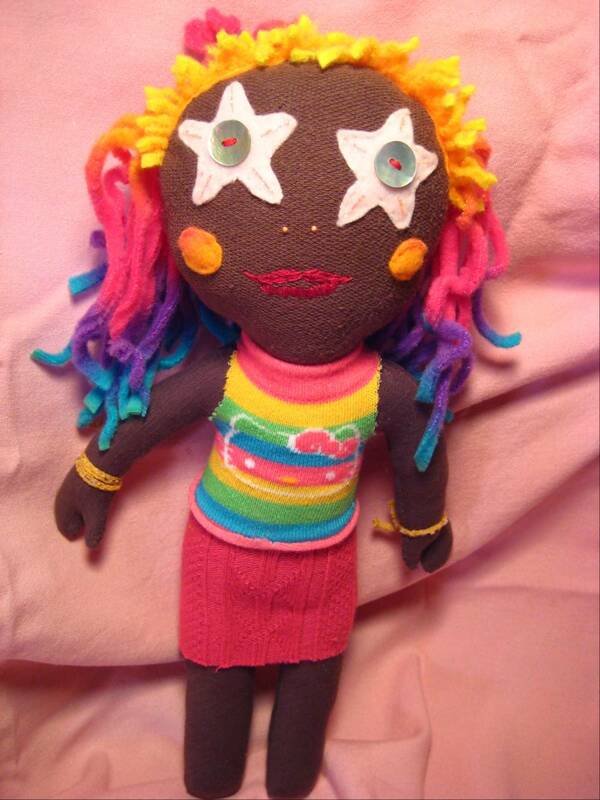 This soft sculpture was created for all the brave, true souls who struggle to claim their identity and come through that experience victorious. I love you all. You make a big difference just by being you! Returning a Redbox freebie DVD at the Raley’s near my home I was treated to the sight of a magnificent double rainbow. I did not have my camera, boo. When we got home I jammed inside the house to get it. 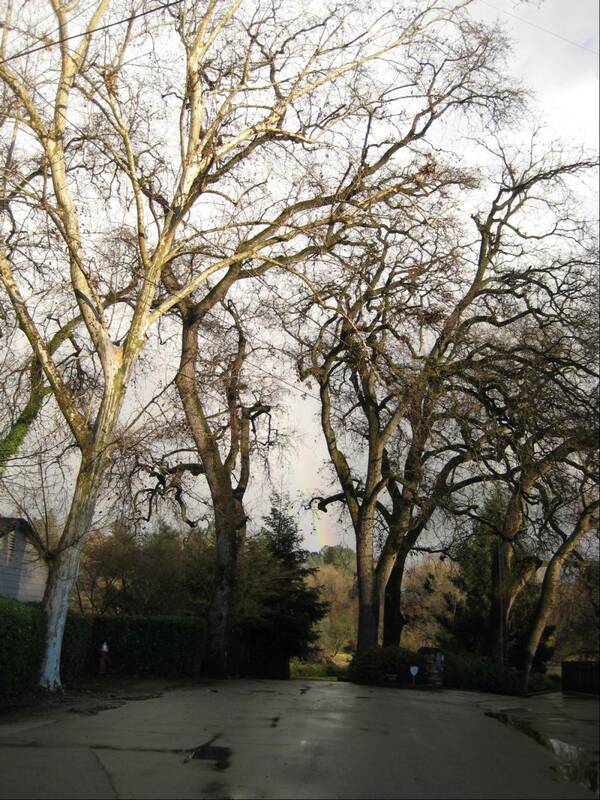 The rainbow was visible in the center of a stand of trees at the end of our street. It had faded a lot by the time I got back. If you click this pic you can almost make it out. Right in the center above the tree line on the other side of the river. I’m always telling myself to keep the camera on me. When will I listen? Really though, the experience was all it could be in the moment.The rainbow was big and bold and bright. Somethings are ephemeral. That’s part of their magic. Bought Yeats’ Celtic Twilight:Faerie and Folklore. It should be very interesting. 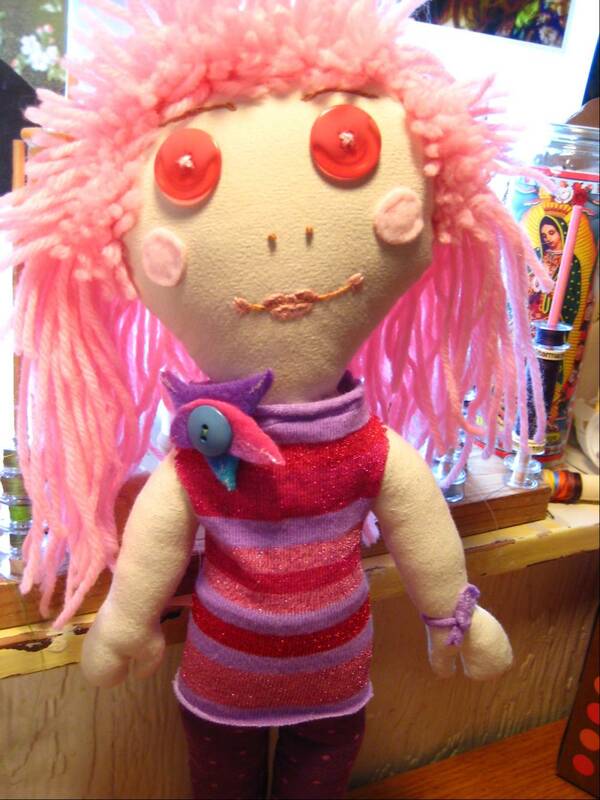 I spent most of today reworking two of my dolls. 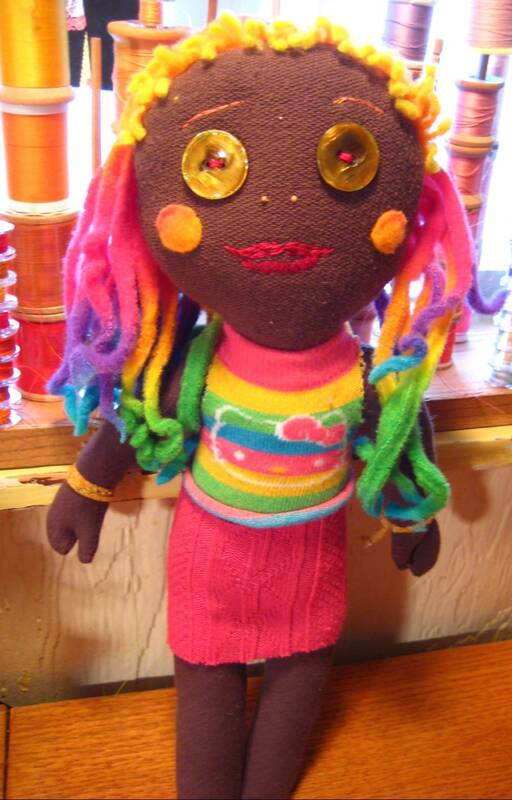 I removed the star/abalone eyes from my first Rainbow Soft Girl and gave her new gold glitter eyes. The star eyes were just too much. I had envisioned this Soft Girl as a sort of Rave Kid or Glammy Girl. I like her better withthe gold eyes. Don’t you love the Hello Kitty shirt? 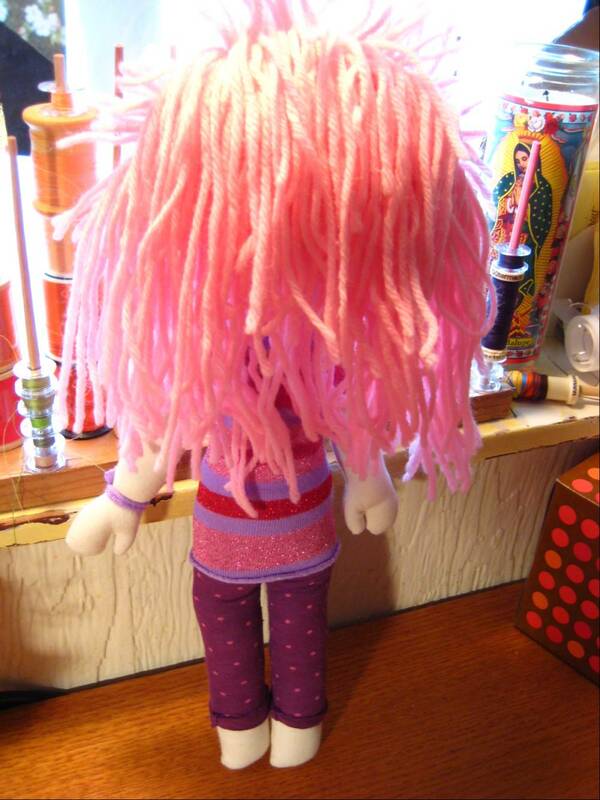 Transformation 2 was meant to fix the neck of my Pink Punky Girl. Her head was a little fat at the bottom where the neck should have been. I added more hair, too. If I showed the before pix you’d never notice the difference but I just didn’t like the look of my first try at joining head to body. 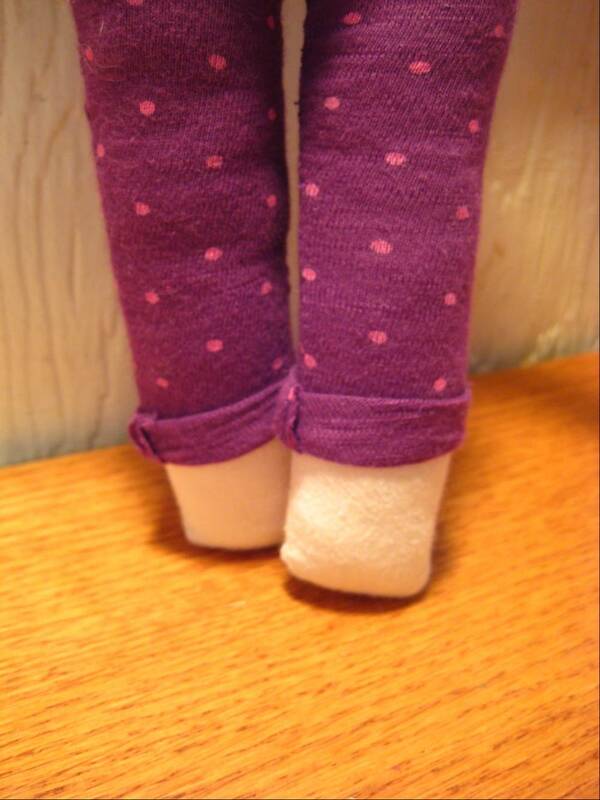 I love her purple pedal pushers with little pink dots. She has very nice embroidered lips, too. It’s been deliciously cool for August in Redding. The last few days were a gift to my senses. Also cool, is the fact that I am working toward meeting the goals I’ve set for the coming weeks. I’m getting the hats photographed for listing them in the DarcyArts shop. They will be in the shop next weekend!! August 15th is the premiere date for my line of super comfy, warm and snuggly hats and caps. I am working with texture and image to create a unique offering of head gear. I’ll have the framed image caps and a the rainbow bill caps and pillbox caps. I tend to make things in bold colors though I’ll have some more sedate things as well. The moss green caps are really sweet. I added a little streamer and floral element to the moss green cloche hat. The moss -colored cap with the striped band is my favorite. I’ll wear one this fall, for sure. It’s really thrilling to visit the thrift shops these days. I’ve got my eye set on rich colors, textures and really fine materials that are unique. I can visualize how they will be combined to bring off something that you won’t find anywhere else. I’ve got a closet full of wonderful things to thrill hat lovers. Treat you head right! Keep it warm this winter. Stop by DarcyArts August 15th!